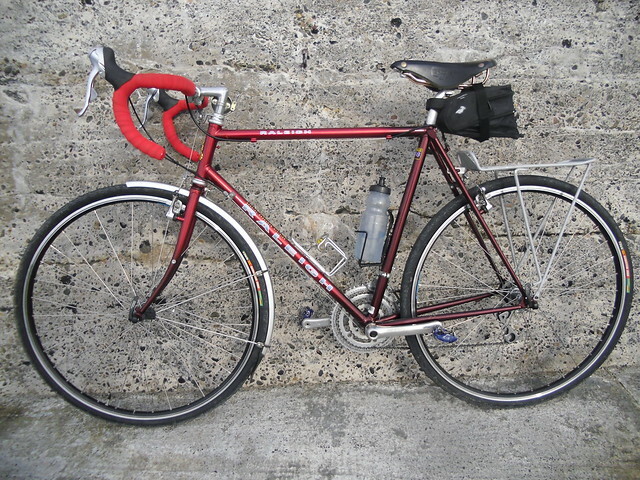 I have a 708 randonneur in grey with white head tube. Your one looks identical in every repsect except for the paint job. Frame number looks similar as well. Mine starts G-----. 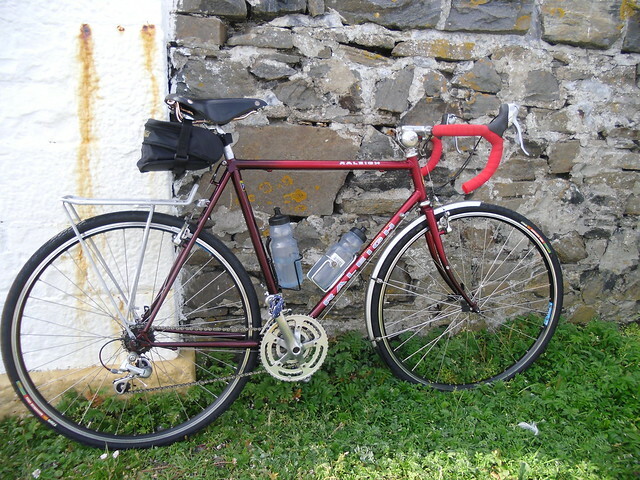 Are you sure it wasn't the late 80's randonneur? That one is grey with a white headtube. If yours is 708, is it exactly the same? I like that a lot, really nice build. The bar tape is a great match. But when you say "finished" do you mean "finished except for the rear mudguard?" I'm not being pedantic (well, a bit...) I'm interested in why you have one on the front but not the rear...? ha, that's a very good point. One of the bolts with the eyes on it has worked its way loose and I lost it, therefore it wouldn't fit without rattling. It will make it on eventually though. I think the tape looks okay but it's difficult to get a colour to go with a red bike that's not black, and black is a little boring in my opinion . . . .
One thing I should probably also mention for anyone that stumbles across this thread and has bought a sumilar thread, the rear spacing was really wide. It has 7 speed RSX shifters, an RX100 triple chainset with 105 1055 derailleurs. You'll notice the Brooks B17 Special ( with copper rails and rivets) was a late and i'm sure you'll agree welcome addition. One thing I should probably also mention for anyone that stumbles across this thread and has bought a similar thread, the rear spacing was really wide. I had just assumed it would be 130 and bought a pair of wheels accordingly. Ended up it was 135mm. Most of the 708 Randonneurs came with a nearly-complete Shimano Deore LX groupset (later models had a Sugino crankset), including hubs. Touring bikes of the nineties often used MTB groups, so 135mm is a pretty common width for the rear end. It makes for a much stronger rear wheel. 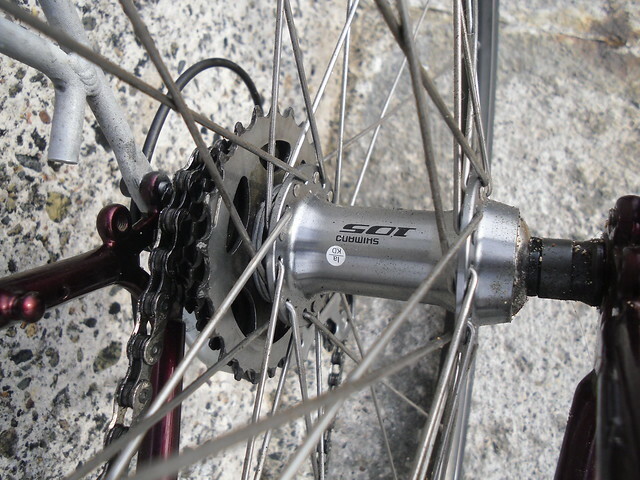 If you're planning to stick with a 7-speed cassette, a 7-speed XT (M732) hub would be stronger still. The vendor says it's an eighties 531ST Randonneur, but it has all the features of a late nineties 708 bike (including the spoke carrier on the left chainstay), plus a late stainless head badge. The paint and decals look original. Looks like a late nineties special to me, but I've never seen another like it. Can this really have spent twenty years in the vendor's garage, as he claims? That one does look nice though doesn't it, it looks nothing like the other 80's ones I've seen on the web. Weren't they made into the early 2000's, but as you say on the newer tube set?